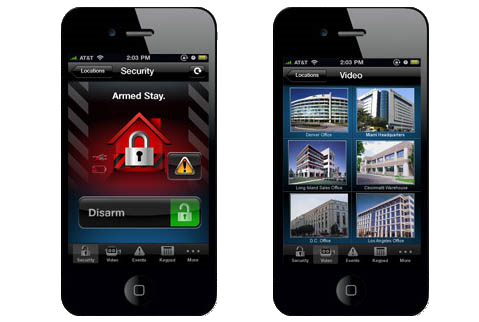 Business Security Systems You Can Access Anywhere! Automated Utility Control Stops Damage to Your Property! When a serious event arises, such as a burst water pipe within the business; the application will notify you and give the option to shut off the water to the building with a simple button press. This is only if the water control regulator has been installed inline of the main water line into the building. This control module can be installed into a control system for less than $100 for the part, along with quick professional plumbing installation of the shut off module. These emergency shut off devices can also be installed for the main electrical to the building or individual water pipes to particular rooms if desired. Sensors will monitor if there is a flood or pipe freeze and then the user can determine what to do with the shutoff devices. Outlets and lighting switches can be swapped out to WiFi devices that allow for mobile control. No longer will a burst pipe or reset of a computer by unplugging it require a trip to the office in the middle of the night.​ If a light got left on at the office, no problem! Turn it off over dinner! Sensors used to be limited to motion sensing and contact closure which is basically opening or closing of a door/window. Nowadays, sensors can protect and notify the same application being used for alarm and security camera viewing. There are sensors that can now detect humidity to keep devices from damage due to large amounts of moisture in the air. This can be useful for server closets and rooms with sensitive materials. There can also be shock sensors to detect movement or vibrations within something or around an object. Shock sensors can help detect if something in the room has been moved or tampered with. Some other amazing types of sensors are, light, UV, smoke, carbon monoxide, heat, flood, and even outdoor sensors to monitor gates and other external equipment. Another great feature within an integrated business system would be fleet management. After viewing your commercial security cameras, the ability to toggle right over into the fleet management portion is a simple click. Fleet management allows a company to GPS track all of their corporate vehicles inside of a single application. Once activated, reports for mileage location, maintenance reports, and other valuable vehicle information is all available within the same app that runs your business alarm system. Having this type of system set up is serious control over your business. Think of the labor cost savings this could be for your business. It's like having your eyes on your job sites and business equipment 24/7. It's an affordable option that stays working while your not watching.